Here are 6 steps to increase your shooting range by 10 yards—and double your odds of success. If there’s any tension in your body it will be transmitted straight to the bow and make the pin flit around on the target like a moth around a street light. Ideally, the pin floats in small circles around the tiny aiming point you’ve picked out. It never has to completely stop moving, it just has to stay close to the spot. Start with your legs and work up, focusing on each body part while shooting to assure that it is tension-free. Most important is your bow arm. Increase strength (or a reduction in draw weight) will help steady your bow arm, and so will a slight bend in the elbow. It doesn’t have to be much, just enough to unlock the joint and allow it to act as a shock-absorber for the shot. There are many different aiming philosophies among top shooters. Some will focus on the spot they want to hit while others watch the pin, trying to keep it still. It calms my bow arm to focus on the immobile spot, but you will need to experiment with this yourself. Build focused shooting into your daily practice routine. Concentrate as hard as you can on every practice arrow (never get mentally lazy on the range). Sharp concentration on each step in the shooting process will soon become habit and you’ll do it instinctively—even when that big buck comes by and melts your cool. You can get by with rough shooting on close shots, but when you stretch it out you have to be as smooth as silk. 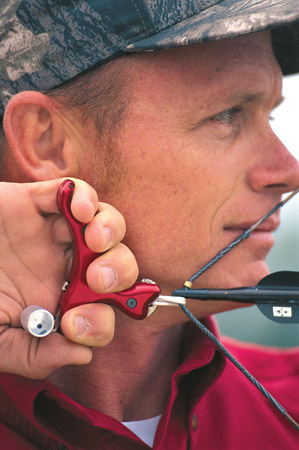 With a release aid, this means squeezing the trigger while focusing on the spot you want to hit. As long as you don’t break your concentration on the target to mentally shout “Now!” the release will be perfect. Ideally, it will take you by surprise. Your only job is to keep the pin near the spot you want to hit until the bow fires. You will immediately eliminate target panic and your long-range groups will become much more consistent. When releasing the string with fingers, get into the habit of triggering the shot by relaxing the back of the string hand. Forget about trying to open the fingers quickly. You’ll never be able to do it fast enough to be consistent. Once you get the proper feel, you can go back to concentrating on the target and let the release happen on its own. There’s nothing more important to long-range shooting than your follow-through. I’ve helped a lot of average bowhunters improve their shooting at 35 yards by doing nothing more than insisting they keep their bow arms steady until the arrow hits. 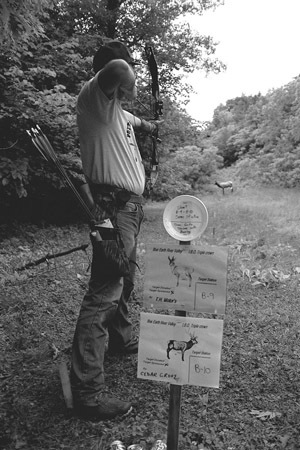 By the same token, keep your mental focus on the spot you want to hit until the arrow gets there. I’ve heard it explained that you should “keep aiming” until the arrow hits. That’s good advice. Confidence is as much a part of long-range shooting as mechanics. You can build in that kind of confidence by doing most of your practicing at ranges beyond what you would take in the field. For example, if you want to be a great shot at 35 yards, do most of your shooting at 45 and 50 yards. After only a few weeks, the 35-yard shot will feel the same way 20-yard shots used to feel. 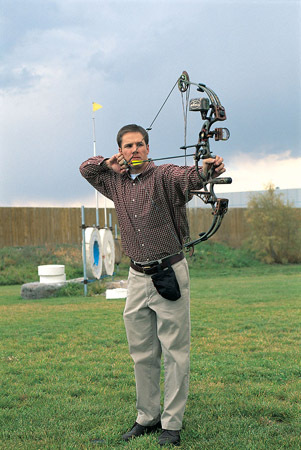 The payoff: As your archery skills improve, your maximum range will increase. For example, let’s assume that you shoot a bow with arrow speeds of 230 fps and you can hold a 4-inch group at 20 yards with broadheads. My calculations show that your maximum sure-kill range is only 20 1/2 yards when you consider range estimation errors of 15 percent. When you can improve your shooting form until you are capable of shafts-touching groups at 20 yards, your maximum range goes up to 30 yards for the same arrow speed. But you can do even better. The faster your arrow travels the flatter will be your trajectory and the better your system will compensate for slight errors in range estimation. Fast arrow speed will increase your maximum range. Here are four ways to increase arrow speed. Increase draw weight: For every pound you increase draw weight, you increase arrow speed by approximately two feet per second (fps). Crank the weight up until you can no longer draw the string straight back and hold it for one minute without shaking. Now back it off a half turn. You should be pretty close to your maximum draw weight. Increase draw length: For every inch you can add to your draw length you increase arrow speed by approximately 31/2 percent. A good anchor point for most bowhunters is the back of their jawbone. If you are stopping short of this point, you can increase speed by increasing your draw length. Shoot a faster bow: Bow design has a big effect on arrow speed. IBO standard speed rating (350-grain arrow, 70-pound draw weight, 30-inch draw length) is the best way to compare bows. IBO ratings between 300 and 315 fps are plenty fast and a good choice for the majority of bowhunters. Bows with IBO speeds over 315 fps generally require better form to shoot well and are best reserved for archers with lots of experience. Shoot a lighter arrow: For every five grains you reduce arrow weight you increase arrow speed by approximately one foot per second. The effect this has on penetration energy is often overstated. If you bench your heavy hunting arrows in favor of shafts that are 25 percent lighter (either lightweight aluminum or carbon) this translates into a decrease in arrow energy of only 5 percent, or less. The payoff: By taking some or all of these steps, you can increase arrow speed by 15 to 20 percent, or more. This translates into a longer maximum range. Suppose your arrow speed increases from 230 fps to 270 fps—and you are shooting 4-inch groups at 20 yards. Your maximum range increases from 201/2 yards to 23 yards. Now let’s also suppose you’re able to use your newly improved shooting form to make perfect shots. Your maximum range jumps from 30 yards to 35 yards. Even though I carry a laser rangefinder every time I go hunting, circumstances still force me to estimate the distance to fully half the game I take in an average season. Many times the animal changes course or approaches from a direction I didn’t expect, not permitting enough time to use a rangefinder. So, if you’re relying upon a rangefinder to do all your work for you, you may be in for a surprise. You still have to be able to judge distance without aid. Gridding is a good method for gaining a quick estimate of shot range. First, choose an object you think is right at 20 yards. Next, lay out blocks of yardage in five or 10-yard increments along the ground until you arrive at your target. With some practice, you can become very quick and accurate at this. You can pace off the distance, or better yet, if you have a laser rangefinder, use it to get instant feedback on the accuracy of your estimate. Since +/- 15 percent (the range estimation error the military attributes to its trained gunners) is about as good as most people can average by eyeball alone, your maximum range isn’t going to increase much simply by practicing your ranging skills. But without this all-important practice it is sure to decrease.